* If anyone knows anyone in Bangalore with any influence please help.Thank you. No news about this child at all. If anyone knows anyone from Bangalore please ask them to help with updates about this case. Thank you. Bangalore: A two-year old girl Bhumika has gone missing from the Kempe Gowda Bus Station (Majestic) on October 2 when she was with her uncle Visveswaraiah on platform number 15. The toddler, accompanied by her mother Girija, aunt Susheela and uncle Visveswaraiah, had just alighted from the train from Mandya. She was wearing an orange frock on that day, recalled her grieving mother. “After getting down from the train we walked to Majestic bus-stand and were waiting for a bus to reach home in Hulimavu. I left Bhumika with my sister and went to look for the bus. Then my sister followed me leaving my baby with her husband. When we came back to take our luggage and Bhumika after the bus arrived, she was not around. My brother-in-law, who was reading details on his new bus pass, had assumed she came along with me. “But she was nowhere around,” Ms Girija said. Her husband Srinivas, who works for a housekeeping enterprise, said that they looked for Bhumika everywhere before lodging a complaint with the police. If anyone finds Bhumika, they can call Ph. : 9980306615. There is still no update on this child. Any help is welcome if know anyone in Bangalore. Thank you. I found a Missing Kids in India site this morning but as my connection is slow, I couldn't open it. Can anyone do a google search for same please and see if Bhoomika is featured on it. Thank you. Is this confirmed? Has she been found? Thanks. I have gone through the missing children India website but cannot find any details! It is a confusing site to navigate as you need to well educated on regions, areas and towns in India to use the advanced search function otherwise you cannot get any information!! So to be honest I have no idea what the outcome of the case is! Sorry! ok thanks Twiggy. I'll try again this morning. Ok this status is unsure. 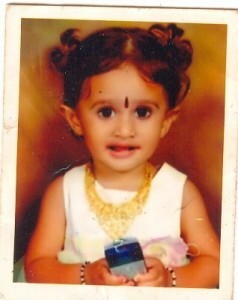 I have found out that Bhoomika was 2 years old on 2 October 2008 when went missing. She went missing from Bangalore or Bengalure as it is also known. It is a city in Karnataka Province in India. I have contacted the Missing Children in India website and I hope to get info asap. I have put in every combination possible to see if I can find anything but Bhoomika / Bhumika is not mentioned anywhere. Found, Missing or otherwise!! A big puzzle!! Maybe she was never listed here to begin with!! I am hopeful even if not listed, they may have heard of the case. If no joy there I will contact the newspaper who shared the story to begin with. All we can do ! I still cannot find any news up dates on this case but I have come across an email and a photo on a blog Archive!! Missing since 2 October 2008. She has been missing approx 4 and a half years..